Working at the University of Illinois Research Dairy Farm has incredible upsides as an animal science major. I started two years ago having no experience with large animals, now dairy cows have become one of my favorite animals to be around. I have learned and gotten so much hands on experience these past two years. These experiences include helping give birth to a calf, seeing hooves being trimmed, watching a surgery to untwist the abomasum (which is apart of the cow’s stomach), and in particular feeling a super ovulated ovary. A super ovulated ovary in basic terms is an ovary that is over stimulated by hormones to maximize the number of eggs that it can produce in one cycle. A couple months ago, my boss at the dairy farm told me a veterinarian was coming to collect ovarian eggs from two brown swiss cows we milk at the farm. This process is called flushing. I immediately became excited because I had never seen this process before. Skipping part of my lunch break, I watched the veterinarian put a tube in the fallopian tube that leads to the ovary. He then used chemically treated water to expand and contract the ovary in order to try to irritate the follicles enough to release the eggs inside them. The water will then carry the eggs out in the tube to a container that I was holding at the time. After this process was done, the veterinarian invited me to feel the ovaries of the cow. The little bumps I was feeling were ruptured follicles. After this whole entire process, I could not help but ponder about how these follicles on the ovaries flourish. At the time, I knew hormones were apart of this process. But how are these hormones made? How do they make follicles? What are these mechanisms? I was diving headfirst into answering these questions. In order to get to the final product of follicles on ovaries, I had to start from the very beginning. I found that all the hormones that are involved in this process are called gonadotropins or glycoproteins, but what are glycoproteins exactly? Where do they come from? The major glycoprotein that is involved in follicular development is called follicular stimulating hormone. The hormones are produced in the anterior pituitary. Just in case you do not know, the anterior pituitary is part of the pituitary gland and is a very influential gland of the body. It controls different hormones to regulate organs and practically the whole body system in general. How are these specific hormones made? Well, I had to go back even further in the process. Follicular stimulating hormone consists of an alpha subunit and a specific beta subunit. The alpha subunit is the same in other hormones, and the beta subunit is a unique part of the follicular stimulating hormone. What is the “alpha subunit” exactly? I found that it was not as complicated as it sounded. 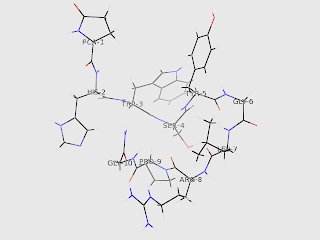 The alpha subunit is basically a sequence of amino acids. 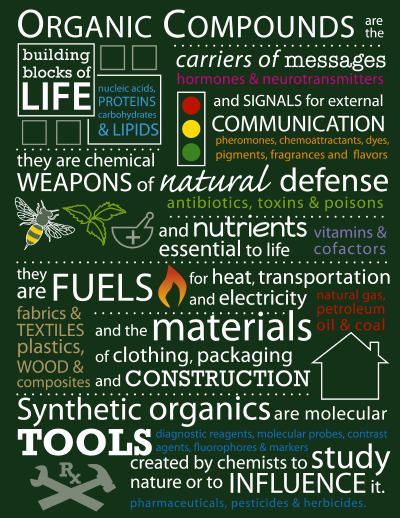 Amino acids are the building blocks for proteins. Amino acids will have a carboxylic acid group, amino group, and unique side chain. Therefore, the alpha subunit is just a protein that is encoded by the gene chorionic gonadotropin alpha. Recall from your basic physiology class that genes encode for proteins so this makes sense! The beta subunit contains a longer amino acid sequence. To complete the structures of these hormones, n-linked glycosylation must occur, but yet another question comes up. What exactly is glycosylation? In short, glycosylation is the process of attaching the carbohydrate to the protein. N-linked glycosylation is where the carbohydrate attacks the nitrogen on a specific amino acid in the protein. In the case of FSH, a carbohydrate will attach to asparagine’s side chain, which is an amino group (nitrogen). So now we know how FSH is made, but what causes it to release from the anterior pituitary? 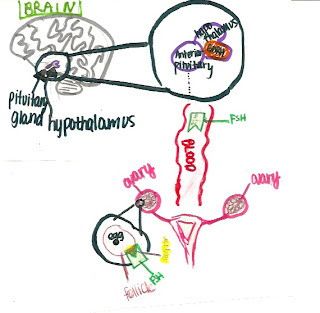 The hypothalamus is one of the ways the glycoprotein hormones are regulated. The hypothalamus will release GnRH. GnRH, or gonadotropin-releasing hormone, consists of ten peptides, secreted from the hypothalamus, and travels to the anterior pituitary in a pulse like pattern. Above is a picture of GnRH. The pulse like pattern in which GnRH is secreted can be contributed to the relatively consistent cycle, the menstrual cycle, that female mammals experience after reaching puberty. Therefore GnRH controls the menstrual cycle. It seemed important to know that the release of follicular stimulating hormone (FSH) depends on the frequency and amplitude of the pulses of GnRH. GnRH will regulate the transcription, or synthesis, of the gene that we just learned about above (chorionic gonadotropin alpha) based on the pulses. Low frequency of GnRH will increase the transcription of chorionic gonadotropin alpha and beta. This process then produces FSH in the anterior pituitary. When FSH is secreted, it will travel in the blood and attach to its receptor on the ovary to create follicles. Before moving on to what happens when FSH binds to its receptor on the ovary, I needed to know more about the receptor itself. The main FSH receptor has a high affinity for FSH, which means the hormone is very attracted to its receptor. The receptor is found on the membrane of granulosa cells, which are the cells that make up the follicle. The FSH receptor is part of a family called the G protein-coupled receptors that situate themselves in the membrane; therefore called a transmembrane receptor. In general terms, the receptor will sense familiar molecules and then do the appropriate signaling inside the cell. One part of the FSH receptor is hydrophobic which means it does not dissolve in water. This is obvious since the cell membrane is made up of a phospholipid bilayer that has a hydrophobic tails inside; therefore part of the receptor must be hydrophobic in order for it to be a transmembrane protein. The other part of the FSH receptor is the extracellular domain. This domain is very important because it is where the hormone binds. 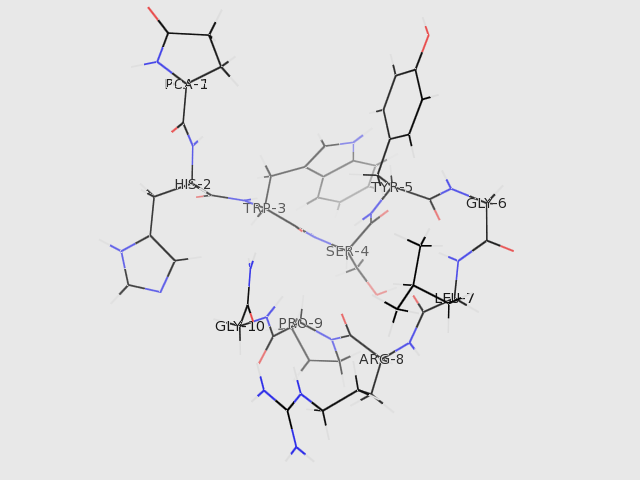 Finally, FSH binds to its receptor. Then what happens? The next steps are a cascade of events. The hormone and receptor will change conformation to make it active. The Gs alpha subunit, which is a protein on the receptor, can now leave and signal adenylyl cyclase within the cell, or follicle. Adenylyl cyclase will then convert ATP (which is where we get our energy!) into cAMP. This pathway is shown below. It is done by removing two phosphate groups and making a ring out the phosphate still attached to the rest of the molecule. cAMP is used on an inside the cell to signal a specific reaction. Because of the synthesis of cAMP in the follicle, protein kinase A is activated. Protein kinase A is an enzyme. It has two regulatory and two catalytic subunits. When there is an increase of cAMP, the enzyme is activated and breaks part the catalytic subunits from the regulatory subunits. Transcription factors will then be activated because of this, and mRNA transcription begins in the cell. That seems like a whole bunch of mumbo jumbo, right? The activation of mRNA transcription is essentially the end of the process in which FSH has an effect on the ovary. What happens? 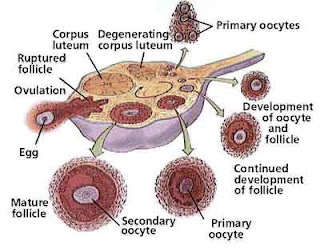 What we are leading up to is the synthesis and growth of the follicle on the ovary. FSH will cause the granulosa cells to grow and multiply. The growth of the granulosa cells will cause a follicle to become bigger. As you are probably fully aware, the follicle will contain an egg. When the follicle is fully mature, it will rupture at a particular time in the cycle where the egg will be release and have a fate of being fertilized or not. Coming full circle, as I felt the brown swiss cow’s ovaries, I had no idea how complex the mechanism of FSH was on those super ovulatory follicles I was feeling. I could not imagine how much cooler animal science could get. All I knew was there was one hormone that was partly responsible for the excitement I received that day. But really it was not just that one hormone. It was the organic chemistry in and of itself. One thing I wanted to end on is why should you care? The process of super ovulating ovaries (increasing the amount of FSH to increase follicle production) is not a new phenomenon, and it is practiced widely today. This process is so important because we can increase the amount of good eggs, which increases chances of pregnancy in production animals, which in turn increases efficiency. The United States is a consumer society. We have cheap food so we can afford to buy other things. Increasing conception rate for production animals allows for maximum efficiency for that animal. Maximum efficiency means less input to the animal which gives us cheap food. For humans, it gives women the ability to increase their chances of pregnancy, freeze her eggs for a later date, or donate to a woman who has infertile eggs. These are just some ways super ovulating and the mechanism of FSH on an ovary is important to today’s society and why it is so exciting to me. Bernard, Daniel, et. al. 2010. Mechanisms of FSH synthesis: what we know, what we don’t, and why we should care. Fertility and Sterility 93: 2465: 2485. Simoni, Manuela, et. al. 1997. Follicle Stimulation Hormone Receptor: Biochemistry, Molecular Biology, Physiology, Pathophysiology. Endocrine Reviews 18: 739-773. Bousifield, George and Diaz, James. 2011. Synthesis and Secretion of Gonadotropins including structure function correlates. Review Endocrine Metabolism Disorders 12: 289-302.